I am very excited to announce that I will be playing a very special fundraising concert in Stratford, Ontario on June 24, 4pm. What makes this concert 'very special' (as opposed to just 'special') is that I will be performing on the piano that was bought in Copenhagen by my mother, when I was a child...the piano that I grew up with! The piano that helped me decide to become a pianist! The concert will take place in the beautiful newly refurbished Upper Hall at St. James Anglican, where I used to work as Director of Music. St. James purchased this piano from me a year ago, just before I moved to Copenhagen. Before the piano was moved to Stratford, it had some major work done on it, so I can't wait to 'meet' it again, in its new home, and newly restored. This Hornung & Møller piano is a make that is not very known in North America, but in Copenhagen I continue to find many of them around...think of it as the "Steinway of Denmark". 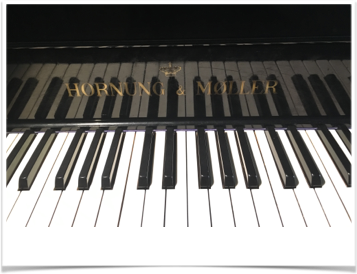 The Hornung and Møller piano company began when C. C. Hornung built his first piano in 1827, after a trip to Germany. From 1834 on, he produced about 30 pianos annually, and continued at that pace until 1842, when he moved production to the Danish capital, Copenhagen. In 1851, Hornung's associate Hans Peter Møller took over the company, giving the company it's name, Hornung & Møller. After H. P. Møller's death in 1859, the company was run by his widow, and his son, Fredrik. In 1872, the factory was moved to a Bredgade address in Copenhagen, not far from the royal palace. The piano builder had been granted the designation of "by appointment to the Royal Danish court" in 1843, and supplied pianos for the Royal family...they even had one on the royal yacht in recent years. In 1907 Hornung & Møller became a publicly traded company. Hornung and Møller produced upright and "table" pianos (until 1880), in addition to grand pianos. I remember hearing that Edvard Grieg owned a Hornung & Møller, as did Oscar Peterson. Apparently, when my mother was shopping for the piano in Copenhagen and asked whether one could be shipped to Canada, the answer was "yes, we just shipped one to Oscar Peterson". In the national archives of Denmark, you can look up the serial numbers of all the Hornung & Møllers ever made; the record shows this model as having been built during 1971. The company closed in July of 1972, having built more than 50,000 instruments over the years. Funds raised from this concert will go toward the cost of refurbishing the beautiful community space at St. James: the Upper Hall. Hope you can come! The program will last about an hour, giving you plenty of time to go out for a spectacular dinner before seeing an 8pm show at the Stratford Festival.